So today, I'm sharing all of the goodies I got while I was at the Stampin' Up! Convention. 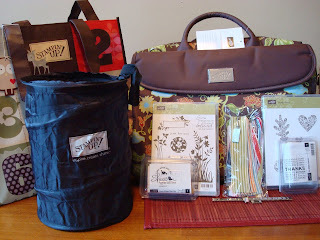 Some of the items I'll be sharing were gifts from Stampin' Up! and others were items I bought that are exclusive to demonstrators and purchased at Memento Mall. Enjoy! 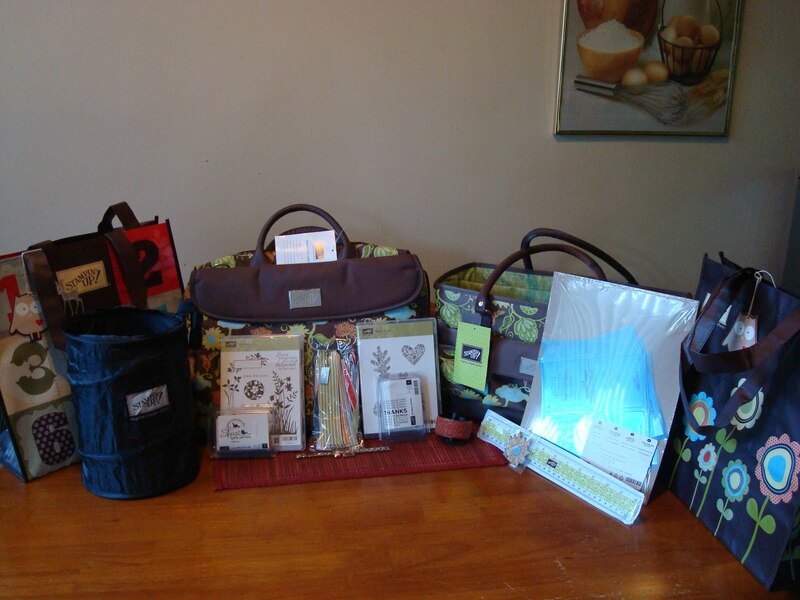 Here's a group shot of all the goodies! I love them all! Here's a close-up of some of the items. 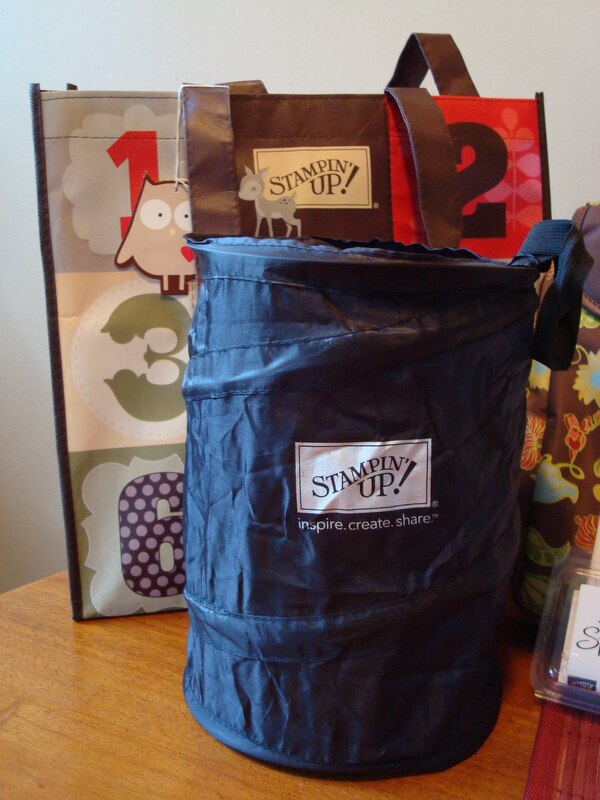 In this picture you see A Play date DSP reusable bag, a Stampin' Up! collapsible trash canister, NEW Ribbon sampler, Italian Charm Bracelet and 2 charms. Here's some more items: A Greenhouse Gala ruler and Keychain, Punch Sampler, another Play date DSP reusable bag, and a Greenhouse Gala craft tote. I really, really loved all the items I bought! 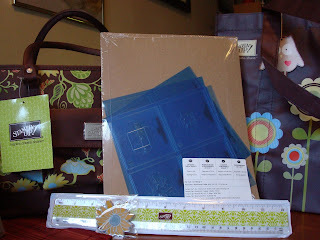 =) Some of the rulers will be raffled off as doorprizes in upcoming workshops as well as some of the reusable bags. So book a workshop now to try to win some free goodies! Here's a close-up of the trash canisters. I love them, I bought 4, one for each of the tables I set up at my workshops! 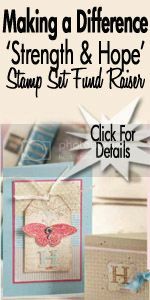 So, now that you have seen all my NEW Stampin' Up! Goodies, are you jealous? Well, don't be! 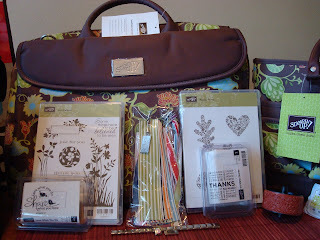 You too can be a proud owner of these items and many more Stampin' Up! merchandise that is exclusive to demonstrators, just by joining my team! Click here to find out more about what I do. If you want more information you can contact me here. 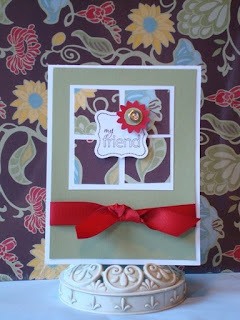 So today, I'll be sharing pictures of day 2 of the Stampin' Up! Convention. I hope you enjoy reliving with me the fun I had while in Utah. It was a blast and I honestly can't wait till next year! 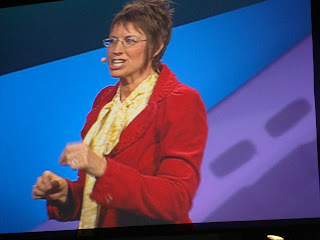 Here's Shelli Gardner on the main stage during General Session. Everyone in attendance looks forward to hearing Shelli talk at Convention. She is so energetic and enthusiastic and she always shows her love for all of us! Can't say that about very many Presidents and CEO's of other companies! I also always look forward to seeing what new outfit she'll be wearing each day. I have yet to see her in something I didn't like! 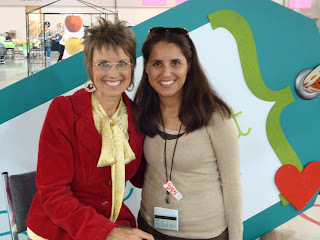 This is the stage in the Gathering Place where Shelli was taking pictures and signing books. I had her sign my name badge and my Convention Booklet. I'll try to remember to take a picture of them and post them soon. 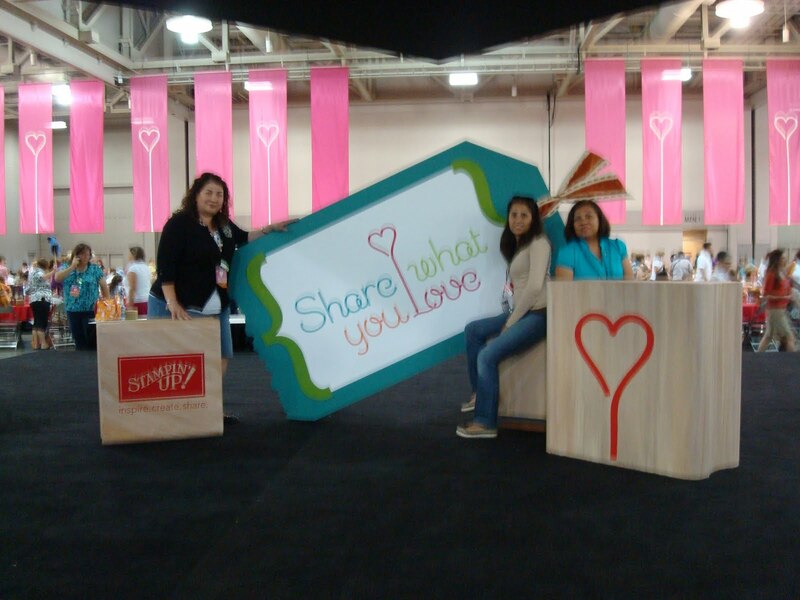 The girls and I (Yolie and Maria) took a picture together while waiting for Shelli to show up. And here's a group picture with my wonderful Stampin' Up! Family. It turned out to be a great picture if I do say so myself. 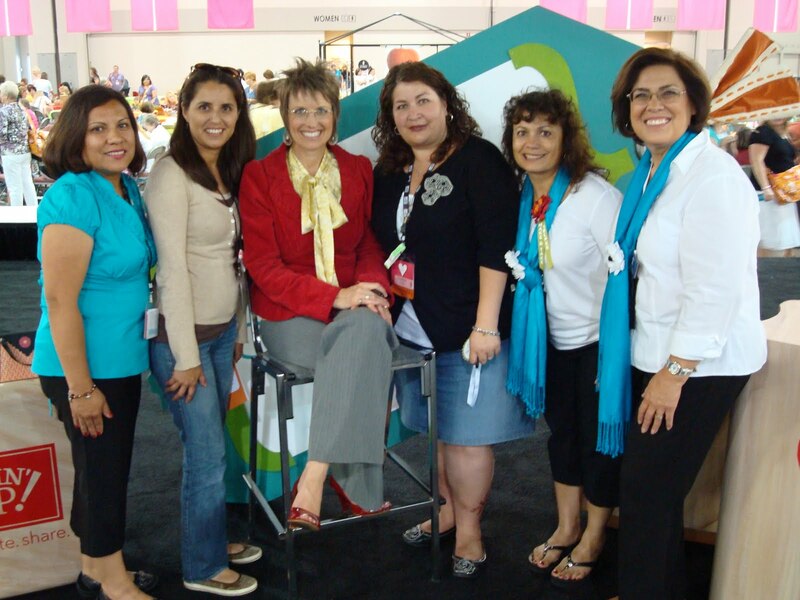 From Left to Right: Maria Carillo, Me, Shelli Gardner, Yolanda Tamayo, Ann Corley and Martha. Extra! Extra! Hostess Special, Read All About It! Do you live in the Montebello, CA area? If so, schedule your next workshop with me by August 31 and earn an additional $25 in FREE Stampin' Up! 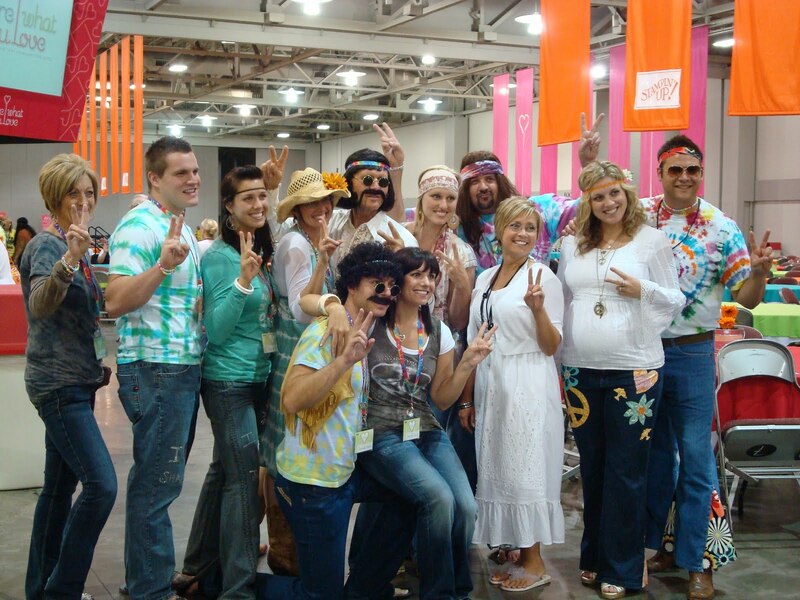 merchandise, starting with a $350 workshop order! 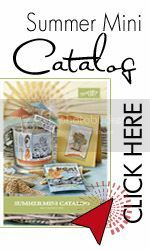 Or email me to learn more about hosting a catalog workshop! CLICK HERE FOR $25 HOSTESS BONUS FLYER! Back from The Stampin' Up! Convention!! I have been back from Convention since Sunday and have been catching up on some much needed rest and relaxation! It was a very fun, memory-filled experience! We drove up to Salt Lake City for the first time and it was quite a road trip! I will share pictures of our road trip and the stops we made along the way. 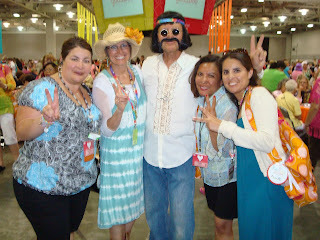 But today I'll be sharing some pictures from the Convention. Enjoy! 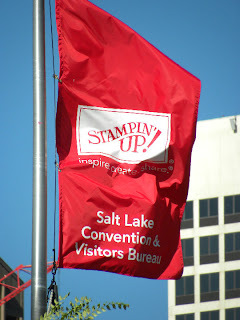 Here's a pic of one of many flags hanging outside of the Salt Lake City Palace, where the Convention was held. 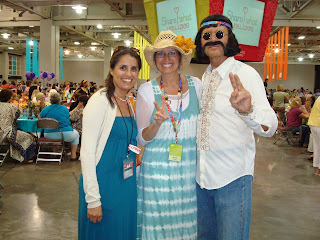 I took a picture with I believe it's Shanna's Husband. 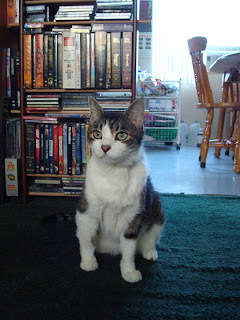 He was such a funny guy! 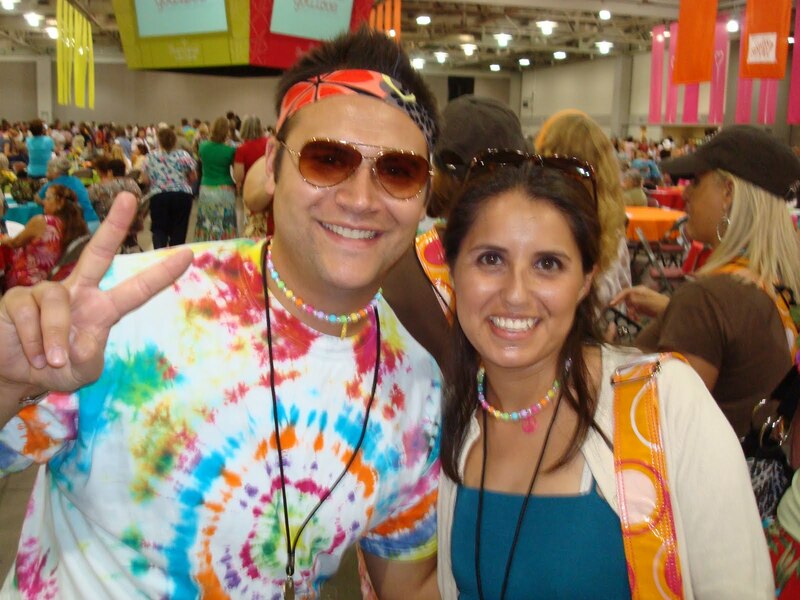 At Convention on Wednesday night, there was a Flower Party themed party. It was lots of fun. Here's a group picture with my upline Yolie, sideline Maria, Shelli and Sterling. They are so sweet and caring people, it was a thrill to meet both Shelli and Sterling. Here's a picture of all three projects. So what do you think? And here's the first card we made. I loved it, so simple and quick but so elegant. At least in my opinion it is. 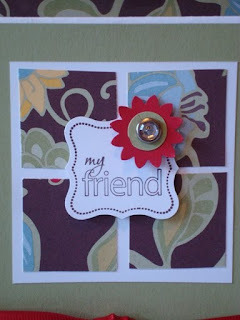 ;o) This card uses the NEW color, Pear Pizazz. It's similar to Certainly Celery except that it's a shade darker. I love it, and believe me I am not a fan of the color green, so that's saying a lot! So the Pear Pizazz piece was layered onto the Whisper White Cardstock. 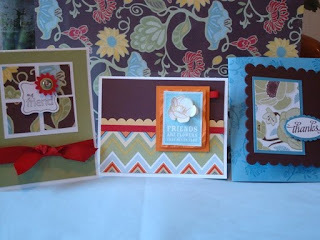 Then we punched out four 1-1/4" squares out of the NEW Green House Gala Designer Series Paper. I love this new DSP and the colors, oh my gorgeous! These were adhered to a 1/8"x 1/8" square piece of Whisper White Cardstock. Next, we stamped "My Friend" from the NEW Perfect Punches set with Chocolate Chip Ink onto Whisper White Cardstock and punched it out with the Curly Label Punch. Then we used the Boho Blossoms Punch and punched out the large flower out of Real Red Cardstock and 1" circle out of Pear Pizazz. These were attached with a large Rhinestone Brad and then attached to the corner of the My Friend with a dimensional. 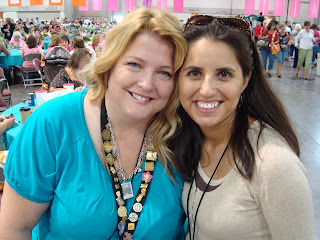 Here is a close-up of the square piece with the My Friend and Rhinestone brad. 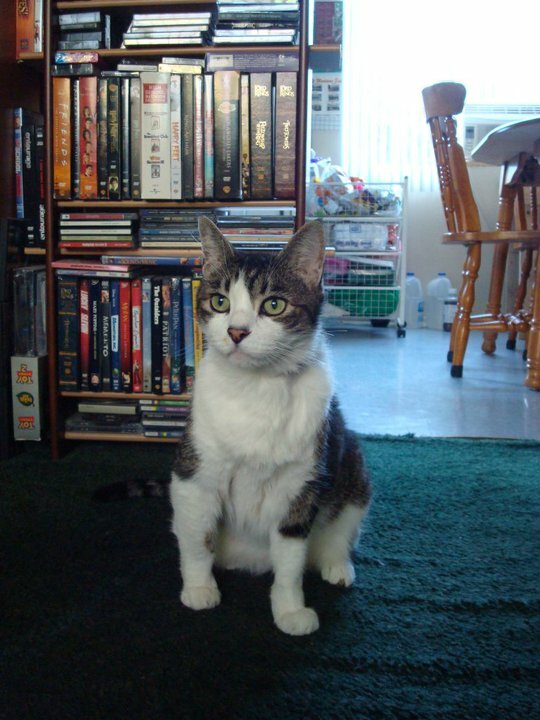 Cute don't ya think? I believe that Yolie CASEd this card from Dawn Olchefske. You can see it on her blog here. 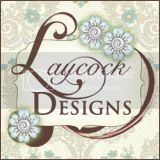 The NEW 2010-2011 Stampin' Up! Catalog is Here!! The NEW 2010-11 Stampin'Up! 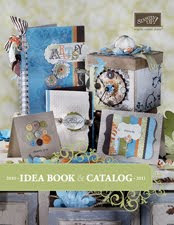 Idea Book and Catalog is now available and waiting to meet you! 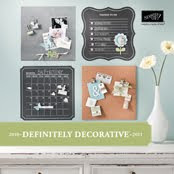 It is GORGEOUS and packed full of new colors, stamp sets, embellishments and so much more!!! With a brand new catalog to share with your friends and family, this is the perfect time to sign up with Stampin'Up!